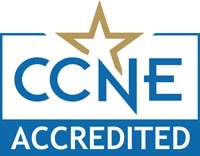 The baccalaureate degree in nursing, master’s degree in nursing, and doctor of nursing practice programs at Washington State University College of Nursing are accredited by the Commission on Collegiate Nursing Education (CCNE), 655 K. Street, NW, Suite 750, Washington, DC 20001, 202-887-6791. The bachelor of science in nursing, post-master’s certificate, and master of nursing programs are accredited through December 31, 2024. The doctor of nursing practice program is accredited through December 31, 2019. CCNE shares third-party comments only with the evaluation team prior to the on-site evaluation. These comments are not shared with the College of Nursing, the Accreditation Review Committee, or the Board. During its review of the program, the evaluation team considers third-party comments, if any, that relate to the program’s qualifications for accreditation. Washington State University is accredited by the Northwest Commission on Colleges and Universities (NWCCU). Most recently reaffirmed in August 2018, WSU has been continuously accredited by its regional higher education authority since 1918.